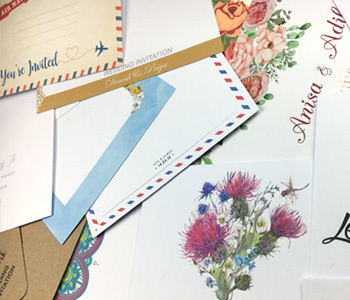 We can print all of your guests names and addresses onto the envelope of your choice to save you time and make your invitations extra special! Add a touch of class to your invites for your big day with these exclusive embossed designer wedding labels. Add that extra special touch and personalise your envelopes with our envelope printing service. We are able to offer custom printing on a range of different sized envelopes at low prices. Whether you need 20 envelopes or up to 10 thousand envelopes printing, we can help. We also offer variable name and address printing. You send us the spreadsheet with all your guests names and addresses and we do the rest! Choose your own font, size and positioning!